The expected clinical course of hepatitis C infection as it affects organ transplant recipients, as well as the use and effect of kidneys from donors who are positive for hepatitis C, remain controversial topics in renal transplantation. Recently published data confirmed that kidneys from donors who were hepatitis C positive (HCV+) were associated with an independently increased risk of death in renal transplant recipients regardless of recipient HCV status (1). However, donor hepatitis C seropositivity (DHCV+) was not independently associated with mortality when limited to patients with valid information (Centers for Medicare and Medicaid Studies [CMS] Form 2728) on comorbid conditions at the time of dialysis initiation. This may have been because of the relatively small numbers of transplant recipients for whom complete data were available during the study period or because cardiovascular comorbidity was actually lower in patients who received DHCV+ kidneys, yet the mortality risk for recipients of DHCV+ kidneys was still greater than for patients who received DHCV− kidneys. Possibly, recipients of DHCV+ kidneys were sicker to start with and thus had a higher risk of death unrelated to receiving a DHCV+ kidney. Since that study, there have been substantial changes in maintenance immunosuppression practices in the United States. In particular, recent reports have confirmed that mycophenolate, in comparison with azathioprine, is associated with a reduced risk of both death-censored graft loss (2) and death with graft function (3). For better determining whether donor and recipient hepatitis C serologic status remains important in graft and patient survival in modern clinical transplantation, a historical cohort study analyzing the 2002 United States Renal Data System (USRDS) data assessed those factors associated with HCV+ kidneys while controlling for variables previously established to have an impact on outcomes. The data set and analytical techniques have previously been described (4). In summary, the USRDS standard analysis file (SAF) provided the primary file including information at the time of transplantation. Follow-up information included dates and causes of graft loss, dates and causes of death, approximate dates of allograft rejection, and follow-up serum creatinine levels. Files were merged with the main file using unique patient identifying codes to obtain follow-up data. The file was also merged with SAF.PATIENTS to obtain dates and causes of death. Fewer than 0.5% of living donor kidneys were seropositive for HCV, and therefore analysis was limited to recipients of cadaver kidneys. Sirolimus and tacrolimus were not widely used in clinical practice until 1996. Therefore, analysis was limited to adult patients who underwent cadaveric kidney transplantation from January 1, 1996, to May 31, 2001. Information on medications was limited to immunosuppressive medications. Only one transplantation for a given patient during the study period (which could have been a repeat kidney transplantation or a multiorgan kidney transplantation) was included in analysis. Only cases with specified HCV data for both donor and recipient were included. HCV serology (presumably ELISA, although the variable “HCSRN” legend indicated only “hepatitis C antibody screen,” and transplant questionnaires did not specify generation of ELISA) was not independently confirmed. Similarly, the cause of ESRD could not be confirmed independently. Additional variables in analysis included previous hospitalizations for vascular or peritoneal dialysis access complications (infections, thrombosis, or other dysfunction) that occurred after the first date of dialysis but before the date of transplantation. Comorbidity data, including selected laboratory data, from the time patients presented to dialysis was also available from the CMS Form 2728. Because these data were not available for all patients, these variables were used in separate models. Patients were followed through October 31, 2001. Factors Associated with Use of HCV+ Kidneys Given to HCV− Recipients. Because some American transplant centers allow the use of HCV+ kidneys in certain recipients who are HCV−, we conducted a logistic regression analysis of factors independently associated with a HCV− patient receiving an HCV+ kidney. This analysis used stepwise logistic regression (forward likelihood ratio method) of factors thought to be clinically significant, such as previous history of access complications, as well as demographic and other factors related to patient survival, including donor and recipient age, gender, race, recipient HCV serology, duration of dialysis before transplantation, body mass index, previous transplantation, recipient sensitization, cold ischemic time, HLA mismatch, and use of immunosuppressive medications. This analysis was performed for the entire study population to construct propensity scores for the probability of receiving a DHCV+ kidney (1 if positive, 0 if negative). Nagelkerke r2 and the c-statistic (with 0.5 indicating a probability equivalent to random chance and 1.0 indicating 100% prediction) were used to assess model fit and predictive power. Survival time was defined as the time between the date of transplantation and death, the most recent follow-up date, or the end of the study period. Graft failure was defined as return to dialysis after transplantation and did not include death with a functioning graft. Variables entered into the model were those previously associated with patient and graft survival after transplantation (5) or significant in univariate analysis in Tables 1 and 2⇓ and included transplant center. Medication use was determined as induction therapy (at discharge from the initial transplant hospitalization, primarily for antibody induction therapy) and maintenance therapy. Maintenance therapy was determined at follow-up visits at 6, 12, and 24 mo. For allowing for changes in medication use, any use of medication at the specified visits was considerer maintenance therapy. This resulted in overlap of medications. Therefore, models were also performed excluding medication overlap. Graft loss was analyzed as a time-dependent variable using previously described methods (6) because it has recently been recognized as an independent predictor of patient mortality in kidney transplant recipients (7). Stratified Cox models were performed for each of the following subgroups of particular clinical interest: recipients who were HCV−, recipients who were HCV+, and recipients who were age 65 yr or older. Analyses were also performed excluding patients who received multiple organ transplants. Covariates whose Kaplan Meier plots violated the assumption of proportional hazards over time were assessed using yearly intervals after transplantation, as described in other, similar studies (8). Files were converted from SAS to SPSS using DBMS Copy 7.0 (Conceptual Software, Houston, TX). SPSS version 11.5.0 (Chicago, IL) was used for primary analysis. From January 1, 1996, to May 31, 2001, 46,078 adult recipients of cadaveric kidney transplants met study criteria in the United States. Of these, 2914 (6.3%) recipients had no data regarding their donor hepatitis C status; an additional 6387 (13.9%) who lacked data for recipient HCV status were excluded (with some overlap between the two groups), leaving 36,956 patients for study in multivariable analysis. Notably, recipients with missing HCV data (their own or their donor) did not differ statistically from patients for whom these data were known. Among study patients, only 7121 (19.3%) recipients had valid data for HCV recombinant immunoblot (RIBA), 9.3% of whom were positive, and only 1534 (4.2%) had valid data for HCV RNA, 10.2% of whom were positive. There was no information on donor HCV RIBA or HCV RNA. In logistic regression analysis of factors associated with receipt of a HCV+ donor kidney, the following factors were independently significant: HCV+ recipient, recipient age ≥65 yr, black recipient race, older donor age, lower prevalence of diabetes, increased HLA mismatch, longer cold ischemic time, and lower recipient sensitization. Notably, neither transplant center nor any comorbid conditions in CMS Form 2728 were significantly associated with receipt of a DHCV+ kidney. In this model, which was used to generate propensity scores, the Nagelkerke r2 was 0.54, and the c-statistic was 0.955 (95% confidence interval [CI], 0.946 to 0.964). In logistic regression analysis, the following factors were independently associated with use of a HCV+ kidney in a recipient who was HCV−: recipient age ≥65 yr (adjusted odds ratio [AOR], 4.98; 95% CI, 3.34 to 7.41, P < 0.001), black recipient (AOR, 2.82; 95% CI, 1.97 to 4.05), older donor age (AOR, 1.011; 95% CI, 1.001 to 1.021; P = 0.045), longer cold ischemic time and higher HLA mismatch, and lower use of tacrolimus (AOR, 0.57; 95% CI, 0.39 to 0.85; P = 0.005). Neither a history of hospitalization for access complications, transplant center, duration of dialysis before transplantation nor any comorbid conditions from CMS Form 2728 were independently associated with use of a HCV+ kidney in a recipient who was HCV−. A cross-tabulation of the study population by donor and recipient HCV status (Table 3) disclosed that 280 (32%) of 873 of HCV+ donor kidneys were given to HCV− recipients, and 593 (23%) of HCV+ recipients received an HCV+ kidney. Table 1 shows continuous variables and their unadjusted association with death and graft loss, respectively. Factors that were significantly associated with both death and graft loss included older donor and recipient age, HLA mismatch, elevated creatinine level by the end of the first year posttransplantation, and longer duration of dialysis before transplantation. Factors associated only with graft loss included elevated body mass index, longer cold ischemic time, and higher patient sensitization. Table 2 shows results of categorical variables and their respective unadjusted associations with death and graft loss. 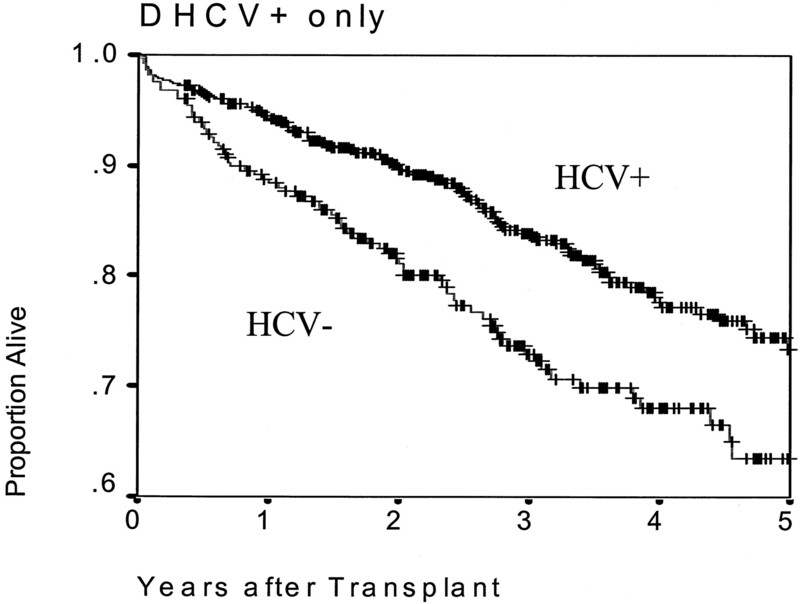 Categories of donor and recipient HCV status were compared with D−/R− (donor and recipient both negative). D+/R− had the highest comparative mortality, and every other category had a significantly higher risk of death in comparison with D−/R−. However, there was no significant relationship seen for graft loss. Figures 1 to 6⇓⇓⇓⇓⇓ show Kaplan-Meier plots of patient survival stratified by recipient and donor HCV status, age, and use of mycophenolate. 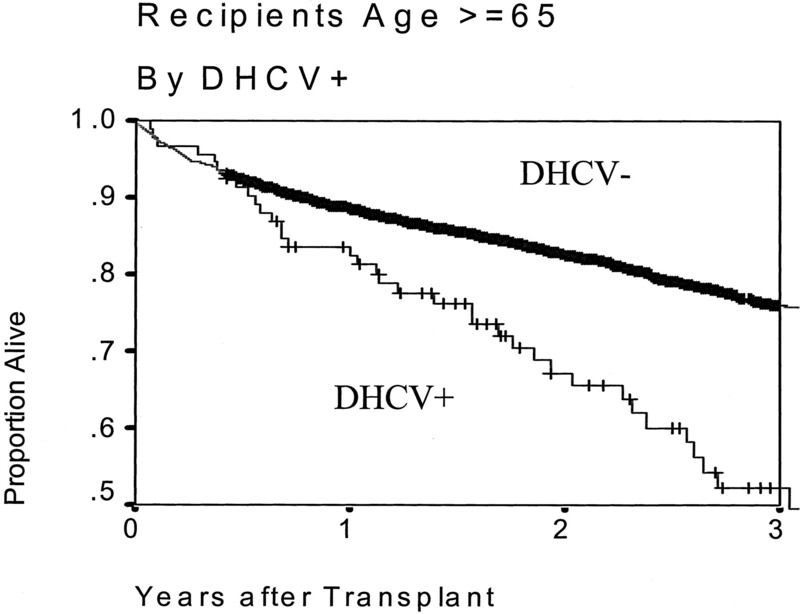 Figure 1 shows HCV+ recipients only, comparing survival for those who received DHCV+ and those who received DHCV−. Survival curves crossed at 2 yr, violating the proportional hazards assumption. In analysis limited to patients who survived at least 2 yr, DHCV+ was significantly associated with greater mortality compared with DHCV− in recipients who were HCV+ (P < 0.001 by log rank test). Figure 2 shows results only of patients who received DHCV+, in which HCV+ patients had significantly lower mortality than HCV− patients in unadjusted analysis (P = 0.01 by log rank test). However, these results did not persist in Cox regression analysis. Figure 3 shows that DHCV+ was significantly associated with increased mortality in recipients age 65 and older (P < 0.001 by log rank test). Figure 4 shows that mycophenolate use (versus all other medications, but primarily versus azathioprine) was significantly associated with reduced mortality in patients who received DHCV+ (P < 0.01 by log rank test). The significant association between DHCV+ and mortality persisted regardless of the use of mycophenolate use, however (Figures 5 and 6⇓). Figure 1. Kaplan-Meier plot of patient survival after renal transplantation, hepatitis C–positive (HCV+) recipients only (n = 2525), stratified by receipt of a kidney positive for hepatitis C (DHCV+) or negative for hepatitis C (HCV−). 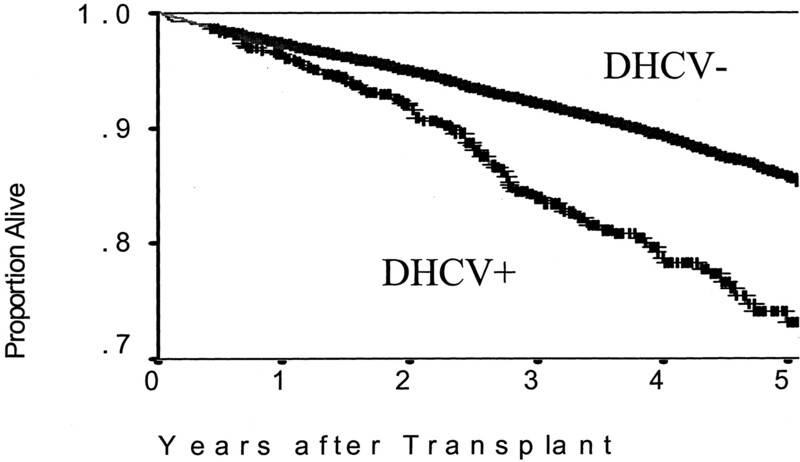 In the first 1 to 2 yr after transplantation, survival was equivalent; however, after 2 yr after transplantation, survival for DHCV+ was significantly lower than for DHCV− (P < 0.001 by log rank test). This association remained significant in adjusted Cox regression analysis (see Table 4). Figure 2. Kaplan-Meier plot of patient survival after renal transplantation, limited to patients who received a kidney positive for hepatitis C (DHCV+; n = 873) stratified by recipients who were HCV+ and HCV−. In unadjusted analysis, HCV− patients had significantly lower survival than HCV+ patients (P < 0.01 by log rank test). However, in adjusted Cox regression analysis, this difference was NS (P = 0.37). Figure 3. Kaplan-Meier plot of patient survival limited to patients who were aged 65 and older (n = 732). Recipients of hepatitis C positive kidneys (DHCV+) had lower survival than those who received HCV− kidneys (P = <0.001 by log rank test). Survival was comparable until approximately halfway through the first posttransplantation year. 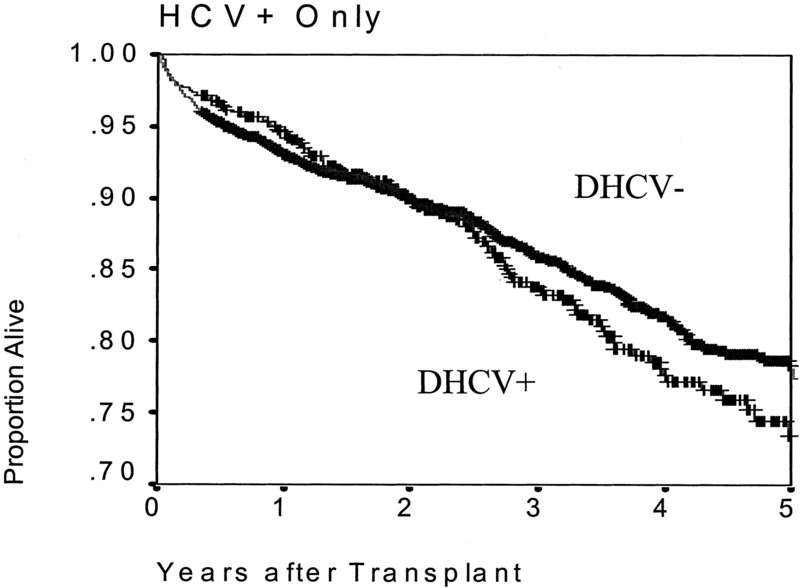 Analysis was limited to 3 yr because of insufficient numbers of DHCV+ past that point. Furthermore, among recipients aged 65 and older who received DHCV+, 19 of 20 specified causes of death were due to either infection or liver disease/hepatitis. Figure 4. Kaplan-Meier plot of patient survival after renal transplantation, limited to patients who received a kidney positive for hepatitis C (DHCV+; n = 873) stratified by recipients who received mycophenolate mofetil (MMF) or those who did not (no MMF). In unadjusted analysis, patients who received MMF had significantly reduced mortality compared with those who did not (P < 0.01 by log rank test). This significance persisted in adjusted analysis (see Tables 1 to 5⇑⇑⇓⇓). 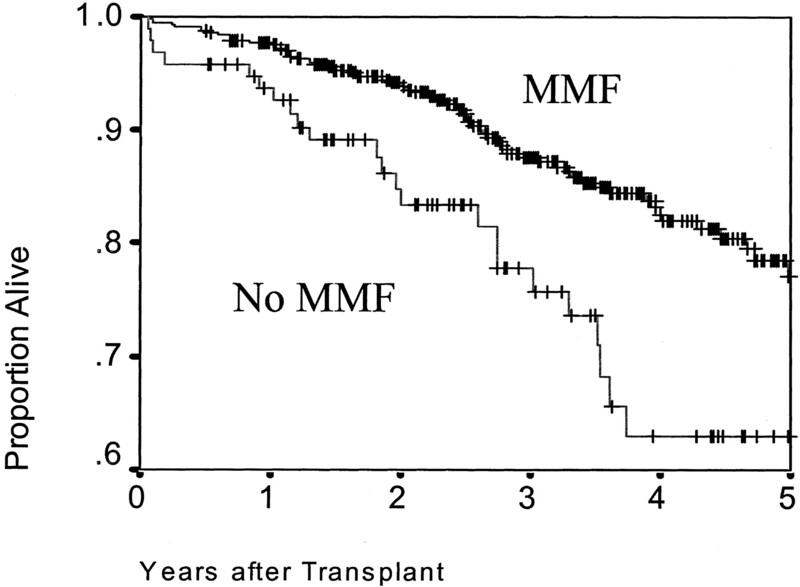 The only major cause of death that was lower in users of MMF was death as a result of infection. Figure 5. Kaplan-Meier plot of patient survival after renal transplantation, limited to patients who used MMF stratified by recipients who received a kidney positive for hepatitis C (DHCV+) or negative hepatitis C (DHCV−). In unadjusted analysis, patients who received DHCV+ had significantly increased mortality compared with those who did not (P < 0.01 by log rank test). This significance persisted in adjusted analysis (see the Results section). Figure 6. Kaplan-Meier plot of patient survival after renal transplantation, limited to patients who did not use MMF stratified by recipients who received a kidney positive for hepatitis C (DHCV+) or negative hepatitis C (DHCV−). In unadjusted analysis, patients who received DHCV+ had significantly increased mortality compared with those who did not (P < 0.01 by log rank test). This significance persisted in adjusted analysis (see the Results section). The independent association of DHCV+ with patient survival for the entire study cohort is shown in Table 4. Table 4 shows results of analysis excluding (left columns) and including (right columns) comorbid information at the time of dialysis initiation. Data on comorbid conditions were available only for patients who started dialysis on or after April 1, 1995, or for 23,405 (63.3%) of the study population. Patients with prolonged waiting times before dialysis would have been less likely to have this information. As shown, DHCV+ was consistently associated with increased risk of mortality in both models. In Table 4, HCV+ recipients had a favorable interaction with DHCV+, but this association did not persist after adjustment for baseline comorbid conditions. Also in Table 4, use of mycophenolate had a favorable interaction with HCV+ that did persist in analysis including comorbid conditions. In recipients age 65 and older, in whom it is often assumed that the contribution of DHCV+ to mortality would be minimal, DHCV+ had a significantly adverse interaction. This interaction did not persist in the smaller model accounting for comorbid conditions. Mycophenolate use had a significantly beneficial interaction with DHCV+ only in the model accounting for baseline comorbid conditions. Results of analyses excluding patients who received multiple organ transplants were not substantially different. Stratified analyses were also performed limited to recipients who were HCV+, HCV−, and age 65 and older, respectively. In HCV+ recipients, analysis was limited to patients who had survived for at least 2 yr after transplantation because of the violations of the proportional hazards assumption shown in Figure 1. The association of DHCV+ with mortality was actually stronger in the model accounting for comorbid conditions (AHR, 2.04; 95% CI, 1.20 to 3.45) than in the larger model that did not account for comorbid conditions (AHR, 1.43; 95% CI, 1.02 to 2.02). In HCV− recipients, DHCV+ was significantly associated with mortality in models without (AHR, 2.30; 95% CI, 1.75 to 3.26; P = 0.025) and with (AHR, 2.25; 95% CI, 1.56 to 3.24; P < 0.001) comorbid conditions. Among recipients age 65 and older (Figure 3), the association of DHCV+ with mortality was the strongest of any subgroup (AHR, 3.48; 95% CI, 2.35 to 5.17; P < 0.001 in the model without comorbid conditions, and AHR, 3.99; 95% CI, 2.46 to 6.49; P < 0.001 in the model with comorbid conditions. Associations of DHCV+ with survival by use of mycophenolate are shown in Figures 4 to 6⇑⇑. Mycophenolate use had a significantly beneficial interaction with DHCV+ in this age group, accounting for comorbid conditions (AHR, 0.49; 95% CI, 0.27 to 0.90; P = 0.03). Among recipients age 65 and older who received DHCV+, unadjusted 4-yr survival was 49% for mycophenolate users versus 27% for non-mycophenolate users (P < 0.01 by log rank test). In comparison, among recipients age 65 and older who did not receive DHCV+, unadjusted 4-yr survival was 71% for users of mycophenolate versus 57% for non-mycophenolate users (P < 0.01 by log rank test). Results of analysis did not differ in models excluding overlapping medications. Causes of death were listed as known in >44% of all cases. Among the 873 recipients of donor HCV+ kidneys, the cause of death was known in 36% of cases. Therefore, results were not compared statistically. Infection was the leading specified cause of death for recipients of DHCV+ kidneys, similar to the incidence of infectious deaths of those who received DHCV− kidneys. In contrast, cardiac death was less common in recipients of donor HCV+ kidneys (13.2%) than in donor HCV− (22.8%) recipients. Deaths as a result of any liver disease were more common for recipients of donor HCV+ kidneys (6.9%) than for recipients of donor HCV− kidneys (1.5%). Neither HCV+ nor DHCV+, separately or as an interaction term, was significantly associated with graft survival in adjusted analysis of factors including serum creatinine at 1 yr posttransplantation (Table 5). However, HCV+ recipients were at increased risk of graft loss in a model that included only baseline factors at the time of renal transplantation (and thus not including allograft rejection, delayed graft function, or posttransplantation serum creatinine levels). The present study confirms that patients who receive kidneys from HCV+ donors are independently at increased risk of mortality. Increased risk persisted in adjusted analysis of every subgroup assessed. Furthermore, the leading cause of death in patients who received DHCV+ kidneys was infection, in contrast to the leading cause of death for all other renal transplant recipients, namely, cardiovascular disease. These findings suggest a direct adverse effect of DHCV+ kidneys on survival in renal transplant recipients, rather than greater severity of preexisting illness in patients who are given DHCV+ kidneys. Recent recommendations include restricting the use of DHCV+ kidneys to patients who are HCV RNA positive, not just ELISA positive (9). However, it is not clear that such patients would be protected from infection by all strains of HCV. A possible adverse effect of DHCV+ kidneys, at least in HCV+ or elderly recipients, has often been discounted because of the long duration between inoculation/viral transmission and development of cirrhosis in patients who contract HCV in the general population (10). This long incubation period has been presumed also to occur in transplant patients, possibly disregarding the impact of maintenance immunosuppression in this population. However, very rapid progression of clinical hepatitis has been documented after renal transplantation as well as in other immunosuppressed conditions, namely HCV and HIV coinfection (11–14⇓⇓⇓) In addition, HCV positivity in the general population is associated with a significantly increased risk of opportunistic infections even in the absence of clinically overt liver disease (15). 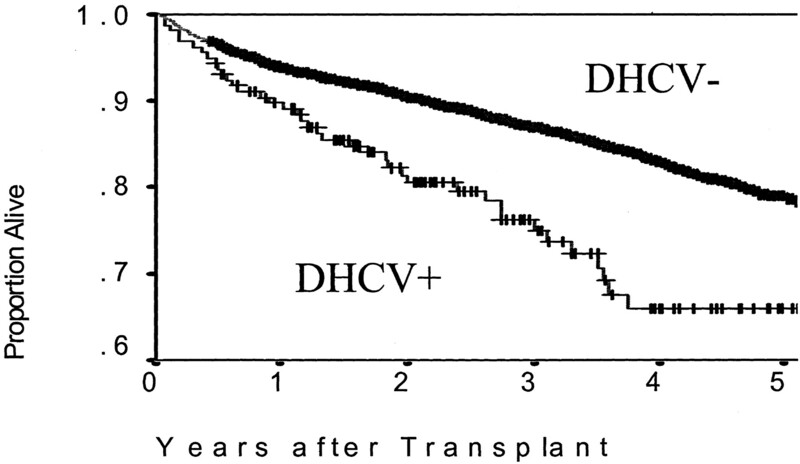 Figure 1 shows that during the first year after renal transplantation, mortality among HCV+ recipients was similar whether they received DHCV+ or DHCV− kidneys. It was only after 2 yr that those who received DHCV+ kidneys manifested increased mortality. Thus, recipient HCV+ serology pretransplantation does not seem to be protective in the long term when a DHCV+ kidney is transplanted. Transplant clinicians have long appreciated that HCV+ transplant recipients are vulnerable to overimmunosuppression (16,17⇓) and have attempted lower doses of immunosuppression or even steroid-free protocols with some success (18). Reports now indicate that hepatitis C viral peptides may themselves adversely affect T-cell function. These effects occur very early after transmission in animal models, often before clinical illness (19), and may have implications for the development of vaccines to hepatitis C (20,21⇓). An abstract reported that such effects on T-cell activity are additive to the effects of calcineurin inhibitors (22). Thus, evidence is mounting that acute transmission of hepatitis C through donor kidneys could result in heightening of immunosuppression, even early after transplantation. The apparent crossing of survival curves at 2 yr seen in Figure 1 for HCV+ recipients of DHCV+ kidneys is consistent with this hypothesis and also consistent with findings that recipient antibodies to HCV do not necessarily prevent new HCV infection (23). DHCV+ seemed to have particularly adverse consequences for recipients aged 65 and older, a group in which it has been assumed that the impact of DHCV+ might be minimal. Elderly transplant recipients are at greatly increased risk of death as a result of infection; minimization of immunosuppression has been recommended in these patients (24,25⇓). Low-dose immunosuppression may be an even more important consideration for elderly recipients of DHCV+ kidneys. The present analysis shows a continued high percentage of DHCV+ kidneys given to recipients who were HCV− in the United States, a practice that is proscribed in Europe (26). Many American transplant centers note that use of DHCV+ kidneys for HCV− recipients is limited to patients who are elderly or have significant access problems limiting their ability to receive dialysis. Although our ability to ascertain access-related problems was limited to those who had Medicare as their primary payer while on dialysis, we did not find that previous hospitalization for access complications or serious comorbid illnesses were independently associated with this practice; instead, older age and black race were the strongest associated factors, independent of time on dialysis before transplant, comorbid conditions, or access complications, all factors that are often cited as reasons to consider renal transplantation in patients who would otherwise not be transplant candidates. We did not find that any specific immunosuppressive medications were harmful in patients who were HCV+ or DHCV+. In fact, we found a beneficial interaction between mycophenolate and patients who received DHCV+ kidneys after adjustment for comorbid conditions. Recent trials have yet to show a benefit of mycophenolate in either renal or liver transplantation for recipients with HCV infection, albeit with very short follow-up and lack of a direct comparison with azathioprine (27–32⇓⇓⇓⇓⇓). However, Fasola et al. (33) showed that manifestations of hepatitis C disease recurrence after steroid-resistant allograft rejection following orthotopic liver transplantation seems to be less severe in patients who use mycophenolate. Mycophenolate has also been used as adjunctive therapy in the treatment of HIV infection (34,35⇓). However, some of the benefit of mycophenolate use may also be due to lowered rates of acute rejection after transplantation (36). Certain limitations of the current analysis must be considered, and they are similar to those of our previous report (1). The most important was an inability to assess the relative survival of recipients of DHCV+ kidneys compared with their potential survival if they remained on maintenance dialysis. Although HCV+ recipients may have an increased risk of mortality compared with all other renal transplant recipients (37,38⇓), Pereira et al. (39) showed that HCV+ recipients have a net survival advantage after renal transplantation compared with remaining on dialysis. However, information on HCV status before transplantation is not available in the USRDS database. We also could not assess the development of HCV seropositivity after renal transplantation. There was incomplete information on comorbidities, although transplant patients are consistently screened for serious diseases before placement on the cadaveric waiting list. Longenecker et al. (40) found that the specificity of CMS Form 2728 was >90% for cardiovascular disease, although sensitivity was lower. Cardiovascular disease may certainly present after initiation of dialysis, but it is often occult and detected earlier by serial echocardiography than by clinical manifestations. After 2 yr of dialysis, most patients have discernible cardiovascular disease; therefore, the duration of dialysis before transplantation may be a reasonable surrogate for underlying comorbid conditions (41). In any case, the best predictor of acute coronary events in the general population is the combination of C-reactive protein and LDL levels (42), which were not available in the database. Causes of death were incomplete in nearly 50% of patients, precluding firm conclusions about mortality. Nonetheless, the analysis includes nearly the entire transplant population and thus minimizes the likelihood of sampling error and referral bias. Transmission of HCV by antibody-negative donors has been reported (43), but this issue is beyond the scope of the present analysis. Also, not all donors who were HCV antibody positive by ELISA were likely to be viremic. This depends on the generation of HCV ELISA assay used, which, unfortunately, the USRDS database did not indicate. The largest study that has so far compared the sensitivity of HCV ELISA for HCV RNA found that 1 in 134,000 donations were RNA positive and ELISA 2.0 negative, compared with 1 in 540,000 donations that were RNA positive and ELISA 3.0 negative (P = 0.001) (44). The specificity of HCV ELISA 3.0 in blood donors is 99.7% (45), similar to ELISA 2.0. HCV ELISA 3.0 was introduced in 1993 and therefore before the start of the current study (46,47⇓). However, according to the Centers for Disease Control and Prevention, in populations with a prevalence of hepatitis C infection of <10%, such as the potential kidney donor pool, the percentage of HCV ELISA assays that are false positive ranges from 15 to 60% (48). The current prevailing opinion is that only PCR-positive donors are likely to transmit disease (49). The proportion of false-positive HCV ELISA assays could not be determined in the present study. However, according to the Centers for Disease Control and Prevention, although HCV ELISA positivity does not always indicate active infection, it does indicate past or present infection. The impact of immunosuppression on organs from donors who were ELISA positive for HCV is not fully known at this time. This study clearly challenges the assumption that donor HCV+ kidneys may be entirely safe for HCV+ and elderly recipients. The persistence of these findings after adjusting for comorbid conditions, as well as the high rate of infectious death among DHCV+ recipients, argues against preexisting cardiovascular disease as an explanation for the increased mortality seen in this analysis. The use of HCV+ kidneys in HCV− recipients also seems problematic. After adjustment for older recipient age and black race, the presence of underlying serious medical conditions and waiting time before transplantation were no longer significantly associated with this practice. Until the link between donor HCV+ kidneys and patient mortality is better established, patient-counseling practices for those who are offered donor HCV+ kidneys may require disclosure of the stark facts that outcomes, possibly including life itself, may be at risk when DHCV+ kidneys are transplanted, consistent with the recommendations for other “expanded donor criteria kidneys” (50). At the very least, studies of the optimal types and levels of immunosuppression (particularly mycophenolate mofetil) in patients who receive DHCV+ kidneys may be enlightening regarding diminishing mortality risk and optimizing overall outcomes, and any patients who receive a DHCV+ organ should be monitored vigilantly for infection. Finally, transplant professionals must consider ways to increase safely and effectively cadaveric and living organ donation in ways that best serve all who are in need of a life-saving organ transplantation. The opinions are solely those of the authors and do not represent an endorsement by the Department of Defense or the National Institutes of Health. This is a government work. There are no restrictions on its use.